Biosphere The zone of life on Earth. Lithosphere The lithosphere is the solid outer section of Earth, which includes Earth's crust (the "skin" of rock on the outer layer of planet Earth), as well as the underlying cool, dense, and rigid upper part of the upper mantle. The lithosphere extends from the surface of Earth to a depth of about 44–62 mi (70–100 km). Hydrosphere A hydrosphere is the total amount of water on a planet. The hydrosphere includes water that is on the surface of the planet, underground, and in the air. 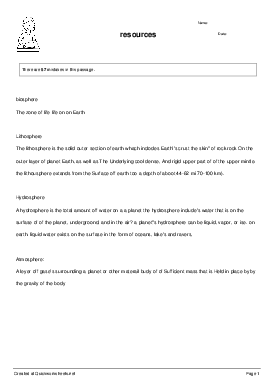 A planet's hydrosphere can be liquid, vapor, or ice. On Earth, liquid water exists on the surface in the form of oceans, lakes and rivers, Atmosphere: A layer of gases surrounding a planet or other material body of sufficient mass that is held in place by the gravity of the body.